If you’re looking for plastic recycling machines, you’re at the right place. Whether you’re interested in a plastic shredder, plastic grinder, plastic granulator,or plastic scrap shredder, Vecoplan delivers the absolute best plastics size reduction machinery – period. We make that statement based on experience. We back it with proof from our customers. Vecoplan has combined both shredder and granulator features to create a line of plastics shredders that meets virtually all plastics processing challenges including industrial plastic scrap, with over 300 configurations tailored to excel at specific applications. Vecoplan has more industrial shredders in more plastics applications than any other manufacturer in the world. That includes companies dedicated solely to recycling plastics, as well as companies that manufacture plastic products and reclaim resin from their own scrap for internal use. 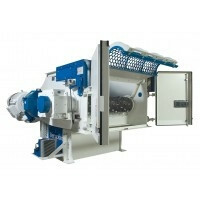 Our plastic shredding machines can be found in the largest plastics recycling plants and in the smallest. Post-consumer plastics recyclers, post-industrial plastics recyclers and companies that recycle both, consistently choose Vecoplan shredders to do it more profitably. 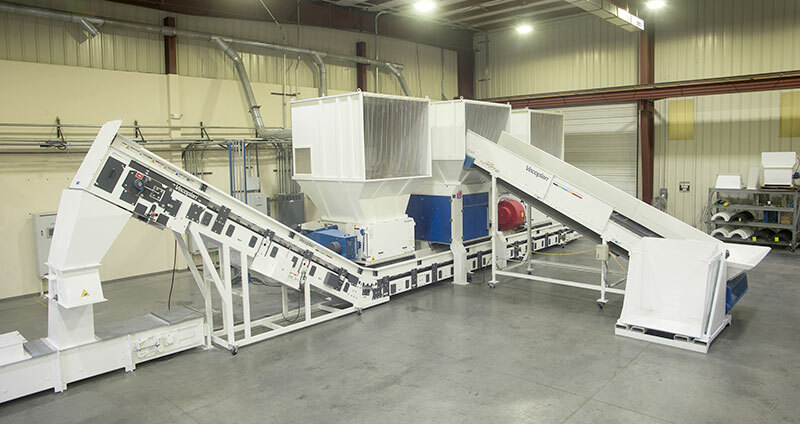 Vecoplan plastic waste shredders play an integral recycling role in how to shred plastic in injection molding, extrusion, blow molding, rotational molding, thermoforming, blown film, cast film, and pelletizing factories. They process rejects, runners, sprues, parts, purgings, pipe, profiles, bags, bottles, bales, buckets, tubs, totes, wovens, nonwovens, film, fiber, carpet, containers, drums, IBCs, lids, - in short, anything made of plastic. The same holds true for all types of resins. As you read this, Vecoplan plastic shredder machines are shredding ABS, Acetal, Acrylic, HDPE, HMWHDPE, LDPE, LLDPE, Nylon, Nylon 6, Nylon 66, PC, PET, Polyamide, Polyester, PP, PS, PU, PUR, PVC, TPE, TPO, and UHW-PE, as well as composites. If it’s plastic – a Vecoplan shredder can grind it up, and grind it down to the size you need. Why do both plastics recyclers and plastics processors prefer Vecoplan plastic shredders? Because of their flexibility, versatility, ease of operation, durability, and ease of maintenance. Flexibility - low bulk density or high bulk density, small parts or big parts, our plastic shredders machine handle them better than any competitor. Versatility – easily changed particle size, through quick & inexpensive screen changes. 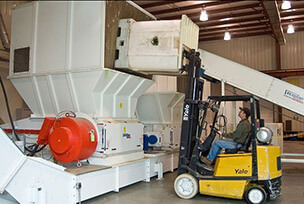 Ease of operation – dump it in, push a button and walk away, or feed it continuously by conveyor. Durability – everyone claims it, we back it up with example after example of machines that have been in operation for decades. Ease of maintenance – our shredder plastic machines and plastic shredder machine products are designed for quick and easy clean out or replacement of wear parts. The overriding reason the plastics industry consistently chooses Vecoplan is because Vecoplan shredders deliver the most positive effect on their bottom-lines. But don’t believe everything you read on the internet. Contact us today and ask for proof. Chances are we have a customer with one of our shredders in an application just like yours, or ship us the material you want to shred, then come visit our test lab and watch it for yourself. 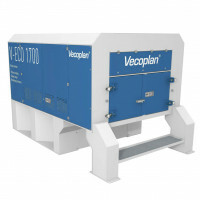 Vecoplan, the worldwide leader in size reduction technologies since 1969, delivers a comprehensive range of shredders for recycling all types of plastics. As a plastic shredder manufacturer, Vecoplan designs, engineers, manufactures, sells, and provides both installation and start-up training on, as well as ongoing parts and service for all of our industrial plastics machines and systems. If you already own Vecoplan equipment and are in need of parts, we've got those too. The best equipment deserves the best replacement parts, from cutters to counterknives. Plastic recycling equipment is a broad term that covers many technologies and different types of waste plastic recycling machinery. The types of plastics materials that are being recycled determine the types of recycling machines required such as a plastic granulator. A closed-loop plastics recycling system, or one in which scrap material is taken from a processing line, in a factory manufacturing a single product from one resin type and in one color, can be quite simple. 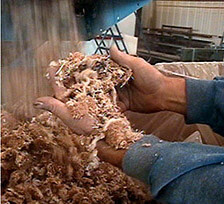 Scrap is simply removed from the line, fed into a shredder, grinder or granulator and reduced to the appropriate size, then conveyed back to the start of the production line, where it is reintroduced as is, or more often blended with virgin resins prior to being reintroduced to the production process. The FF Series of film and fiber shredders from Vecoplan, the worlds leading manufacturer of film shredding equipment, is the only equipment able to provide Vecoplan’s patented SureCut™ Cutting System. 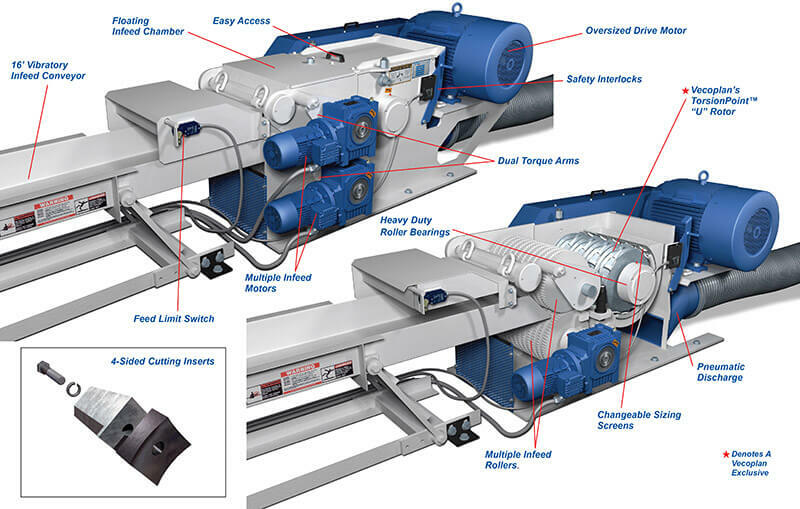 This revolutionary design eliminates the problems encountered with conventional film grinders, fiber grinders, and other types of film recycling equipment including other traditional film and fiber shredding machinery. The SureCut™ system features a specialized cutting geometry that prevents self-feeding and rotor wrapping problems, while delivering precise cut lengths and high bulk densities. 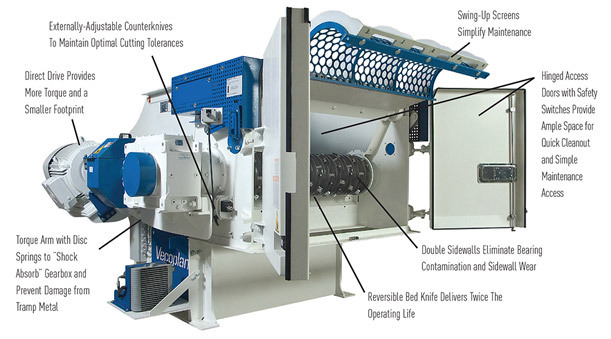 SureCut™, incorporated into all of Vecoplan’s FF Series of shredders for film and fiber, is an integral part of many successful film resin reclaim systems in operation today. Reclamation of plastic resin calls for sophisticated processing, and processing heavy plastic purgings calls for a shredding solution that is tough and reliable. Our resin reclaim systems are designed for high flow throughput with large volumes to meet the highest quality criteria. Vecoplan solutions are highly cost effective for shredding plastic purgings in order to reclaim their resins. Vecoplan offers several solutions for the processing of plastic pipe (HDPE, PVC, PP), including Vecoplan vertical feed single-shaft shredders and horizontal shredders for long pipe sections. 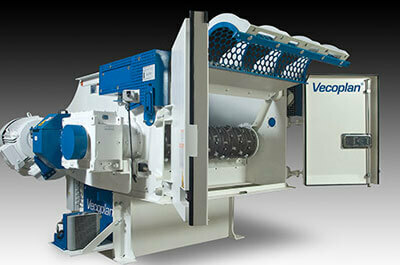 In fact, over half of the top 50 pipe, profile, and tubing extruders use Vecoplan recycling equipment. Plastic bottles, buckets, barrels, drums, IBCs (intermediate bulk containers), totes andtanks are all popular types of reusable containers. 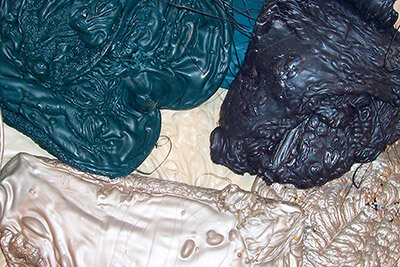 But, at some point, all are damaged, contaminated, or simply wear-out. Once they have reached end of life, their value lies in recycling.The first step in recycling is size reduction, and that’s Vecoplan’s area of expertise. Vecoplan horizontal shredders are fed by 16’ vibratory conveyors designed specifically to move strips, moldings, siding, profiles, composite lumber, pipe, or any long waste. Lineal scrap is pulled from the conveyor and into the machine by both top and bottom feed rollers. A dedicated motor drives each roller. Dual feed rollers deliver aggressive positive feeding and at the same time provide added safety by minimizing material bouncing or flopping common to long scrap. Once inside the cutting chamber, material is processed in much the same way as in our vertical shredders. 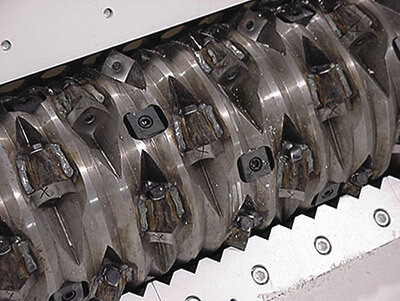 After material is cut between the teeth on the machine’s rotor and the serrated teeth of the fixed counter knife it exits through a sizing screen. 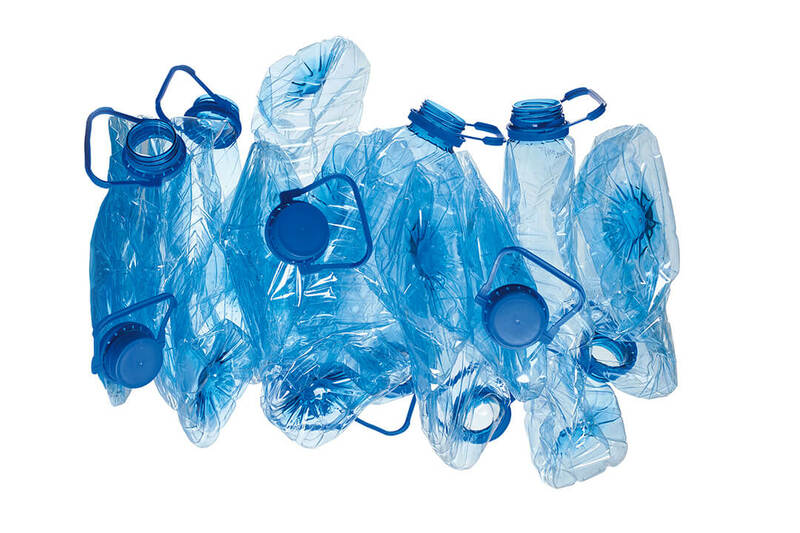 Machinery used in the process of recycling plastic bottles is one example of a Vecoplan shredder application. Sometimes referred to as PET bottle shredders and sometimes as PET bottle grinders, Vecoplan’s plastics shredding machinery is the ideal solution for plastic container recycling of all types. In addition to PET, plastic recycling machines used in plastic waste recycling need to be able to reclaim plastic scrap such as ABS, Acetals, Acrylics, Engineered Thermoplastics, Mixed Thermoplastics, HDPE, LDPE, Nylon, PC, Poloyolefins, PP, PS, PVC, and others. Simply put – Vecoplan’s plastic shredding machines are successfully used in the plastic recycling process for all types plastic scrap recycling! 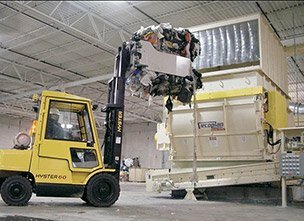 An integral part of a wide range of film and fiber waste recycling systems in operation today, Vecoplan’s FF series is a mainstay in the carpet recycling process. 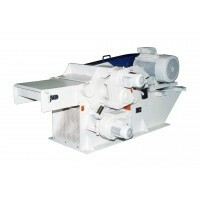 While FF denotes machines in this series as a film and fiber shredder, those involved in processing carpet waste simply call them carpet shredders! 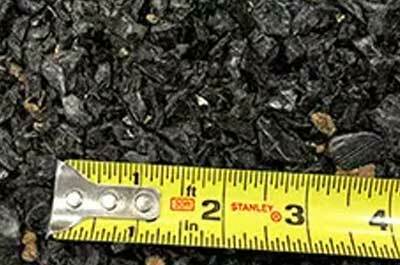 Recognized as the preferred machinery for carpet size reduction, Vecoplan’s carpet shredding equipment is used in systems designed to reclaim and reuse resins and to recycle carpet waste as an alternative fuel source. Molded plastic dunnage is an extremely cost-efficient solution for product protection during shipment, storage, and handling. Designed to fit the exact contour of a given product, plastic dunnage provides maximum product protection - but it is still considered as scrap once the product reaches its final destination. In their continuing efforts to remain on the cutting edge of size reduction technology, Vecoplan, LLC offers comprehensive viability testing of your materials. Their complete in-house test lab and size reduction facility allows you and Vecoplan's engineers to perform feasibility studies on trial runs of your materials under production conditions. All data along with technical analysis remains confidential between Vecoplan, LLC and the customer. For additional information or to schedule a test run, call (336) 861-6070.